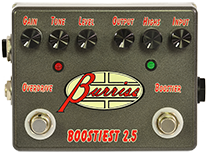 The Burriss Boostiest is a combination of two totally independent gain pedals in a single enclosure. On the right side(input side) is a fully adjustable clean gain pre-amp. On the left side(output side) is a "TS" flavored overdrive circuit. Both circuits feed from the same power source, a single 9V battery or a standard "boss" style power supply. Gain: To achieve the most natural overdrive tone, set the gain knob low and the level control high. The most overdrive effect can be achieved with the level set low in combination with higher gain. Tone: This is a high frequency roll-off control that is used to compensate for the tone changes that occur when the device is engaged. Level: This is the master volume control for the overdrive circuit. Output: This is the master volume control for the boostier circuit. It should be used in conjunction with the gain control to adjust the desired girth of the note. Highs: This control is intended to compensate for the increased bandwidth (brightness) as the gain is increased. Roll this knob back to adjust the stock (bypassed) tone curve. Input: This is the gain control of the boostier (clean boost) channel. This knob is designed to be a set-it-and-forget-it kind of control. It is NOT an attenuator. It is a bias adjustment that will make a TERRIBLE, SCRATCHY NOISE if adjusted with the circuit on. (DON'T TRIP! this is absolutely normal) All adjustments should be done with the device in bypass mode or off. Prototype Boostiest: The box was raw aluminum with a rubber stamp logo, and an enamel clear coat. The Prototype did not have a power inlet or a charge pump. The Prototype operated at 18V with 2 9V batteries set in a hand-made tray. The overdrive and boost cards were separate, and the knobs varied from one to the next. Version 1 (Boostiest): In the first year of the Boostiest, the aluminum box was painted with silver enamel paint and the logo was done by single color silk screen. By the second year other solid colors were available as well. The Boostier was the first iteration to sport a power inlet, on-board charge pump, and an integrated PC card (brown proto-board). This version operated at 18V, but with only one 9V battery. 90% of this version's knobs were black aluminum, while the remaining 10% were silver aluminum. Boostiests built after July 2006 were CE compliant/certified. Version 2 (Boostiest II): The Boostiest II sports a pro PC card with pro solder masking, The highest grade copper cladding is updated Rohs compliant and CE compliant. The box is now high-temperature powder-coat finished with pro multi-color silk screen graphic. The Boostiest II also sports a limited run of boxes with crazing like the top of a 40 year old guitar.